The landscape and the mountains are so beautiful that doesn’t look real. I knew the Alpine region of Austria has gorgeous nature, but I wasn’t prepared for such a stunning place. We spend a week this summer in Vorarlberg and I wish we could have stayed a bit more. There are so many things to do in Vorarlberg in summer time, that one could spend the whole season there. 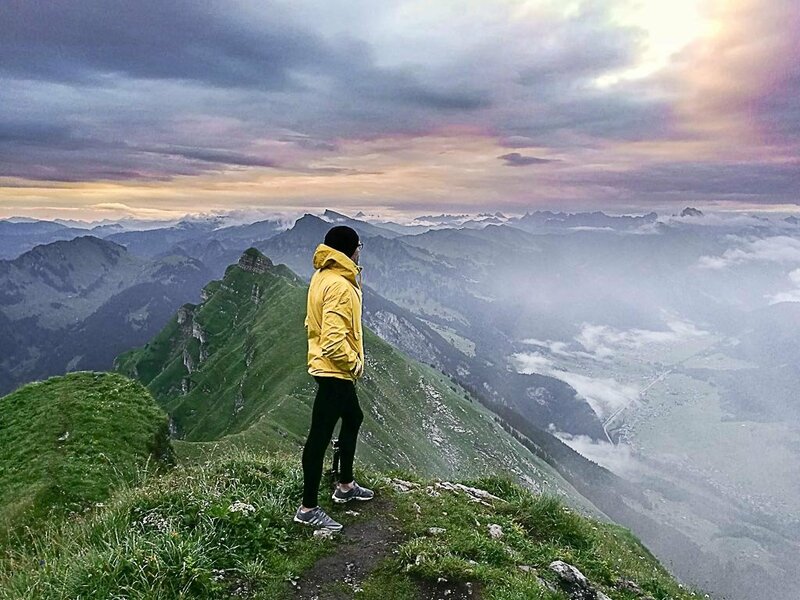 If like us, you love a good adventure and outdoor activities, here is the best guide to summer in Vorarlberg, things to do Bregenzerwald and a lot of adrenaline. Austria is a famous for winter sports. The peaks all covered in powder snow and the resorts full of travelers seeking adventure and fun. But don’t be a fool thinking that Austria is only worth a visit during winter time. Summer in Austria is stunning, packed with things to do and adventure, especially in Vorarlberg. The smallest province in Austria, bordering Switzerland, Germany and Liechtenstein has outstanding nature, great outdoor activities, first class hotels and restaurants. Vorarlberg is divided into 6 small regions, we visited two: Bregenzerwald and Lech Zürs am Arlberg, two ski regions that are also summer wonderlands. 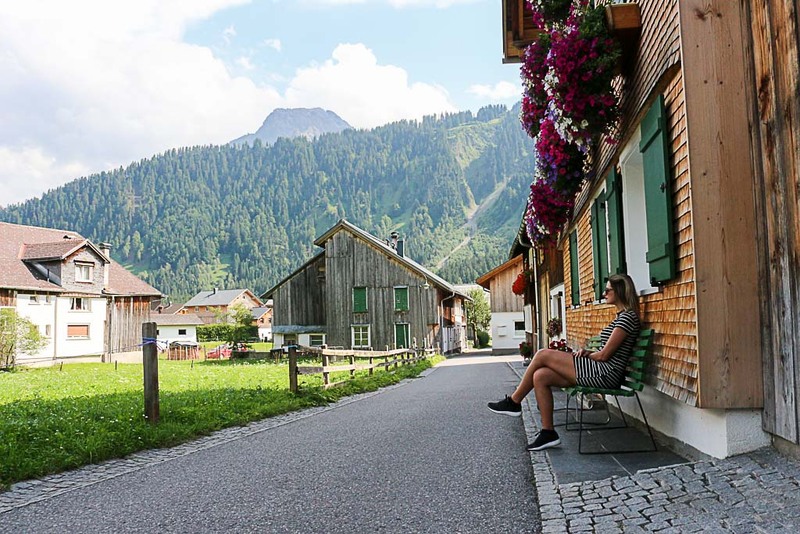 Our guide to summer in Vorarlberg is all about the tops things to do in Bregenzerwald region, hotels recommendations, how to getting around with public transportation, delicious mountain food and incredible adventure. Ohh, and I almost forgot to tell you, summer in Vorarlberg also means less tourists and cheaper hotels. One more reason to travel to Vorarlberg next summer. 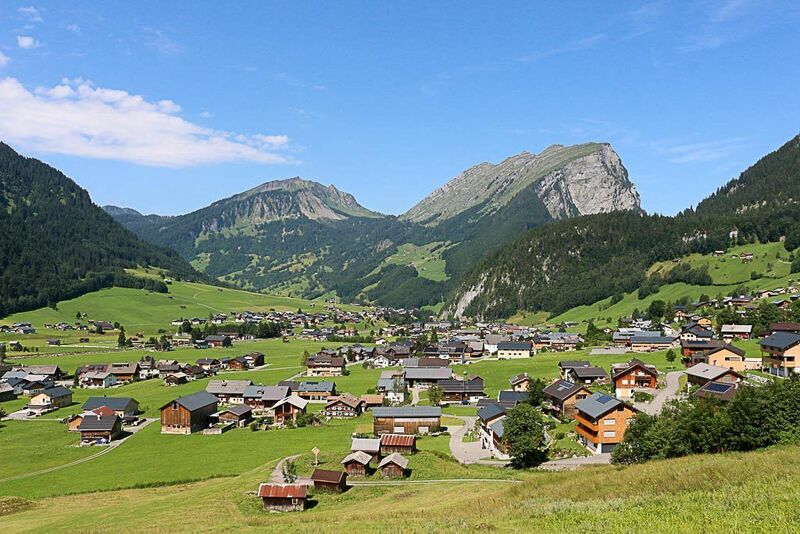 Bregenzerwald region is formed by 22 villages, one more beautiful than other. A truly scenic route through the Austrian Alps. Au was our first stop in Vorarlberg, the perfect introduction to the Alpine lifestyle: outdoor activities, incredible wooden craftwork and cheese. 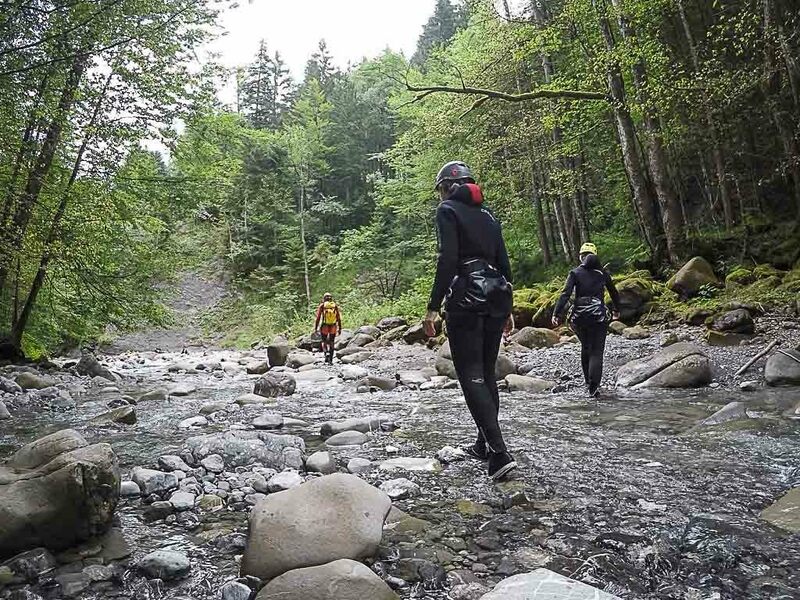 This was our first time canyoning and the first activity we did on our summer trip to Vorarlberg. To be honest, I was petrified! I was worried that I wouldn’t be able to do the abseiling, afraid of the jumps, slides and everything else that might happen inside the canyon. 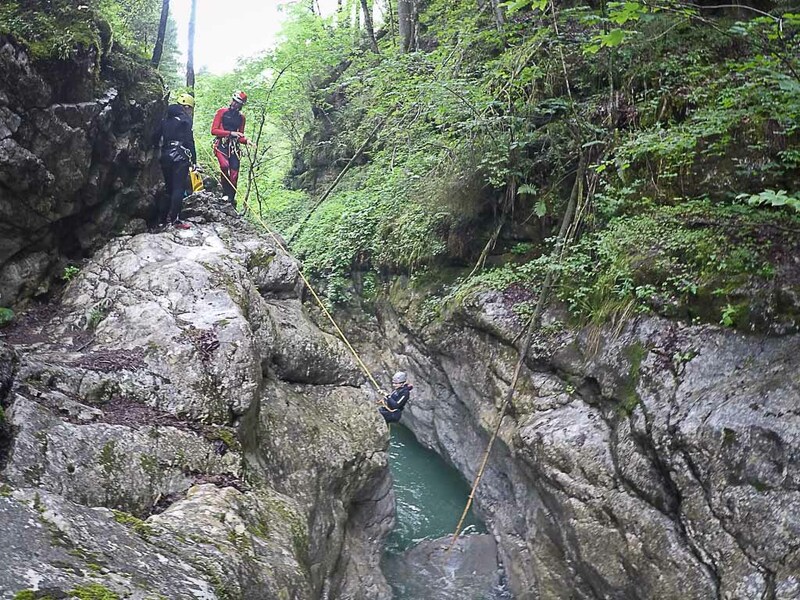 But funny enough, the canyoning turned to be one of my favorite things to do in Bregenzerwald. And I can’t wait to do it again! Technically our canyoning experience wasn’t in Bregenzerwald. Because of the heavy rains in the night before we had to change our plan. Franko, the canyoning guide, decided to skip the Bregenzerwald Canyon and he took us to Merlin’s World, at the Kobelach River. After a 40 minutes drive, we were ready to gear up and learn how to use equipment and how to do the rappel [the scariest moment ever]. But we did fine, we were in four people: Franko – the guide, Rob, me and Becky – the awesome girl behind the Border of Adventures travel blog. During the training we realized that canyoning is teamwork and we were ready to help each other and share the fun. OMG!!! We had so much fun! The water was cold, but our wet suits were thick enough to keep us warm. The surroundings were stunning, waterfalls, rock walls, trees and a crystal clear river. We could hear only the noise of the water running fast and our screams of adrenaline and happiness for doing one more back slide, head slide and two freaking high abseils. 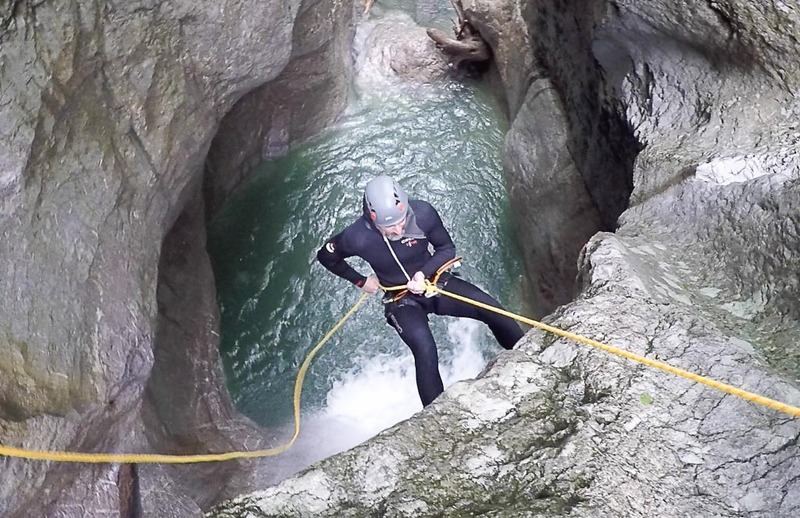 No words to describe how awesome canyoning in Vorarlberg was. Nature is perfect and we had a great guide. Franko taught us how to do the activity, he helped us during the tour and the most important, he made me feel confident to do it. Rob, Becky and Franko helped me to put my fears aside and venture myself on a 7 meters rappel and another 12 meters waterfall rappel. The adrenaline and happiness made us look like children, screaming, jumping and celebrating every challenge we faced. We conquered the Marlin’s World Canyon, 4 hours of pure summer adventure. 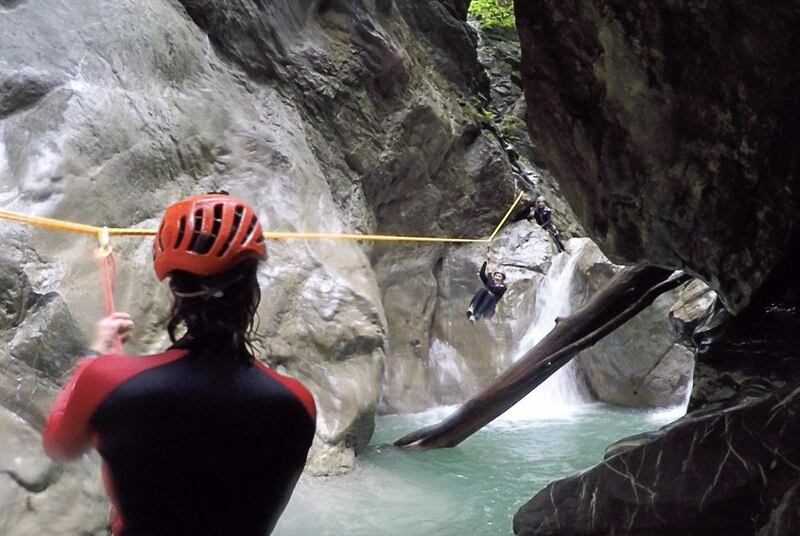 We couldn’t have started our list of things to do in Vorarlberg in a better way, extreme canyoning: checked! If you like speed, downhills and views to die for, mountain bike in Bregenzerwald will fulfill your desire for adrenaline. The region is a paradise for cyclists, from beginners to pro, offering trails and urban paths for any type of cycling activity. 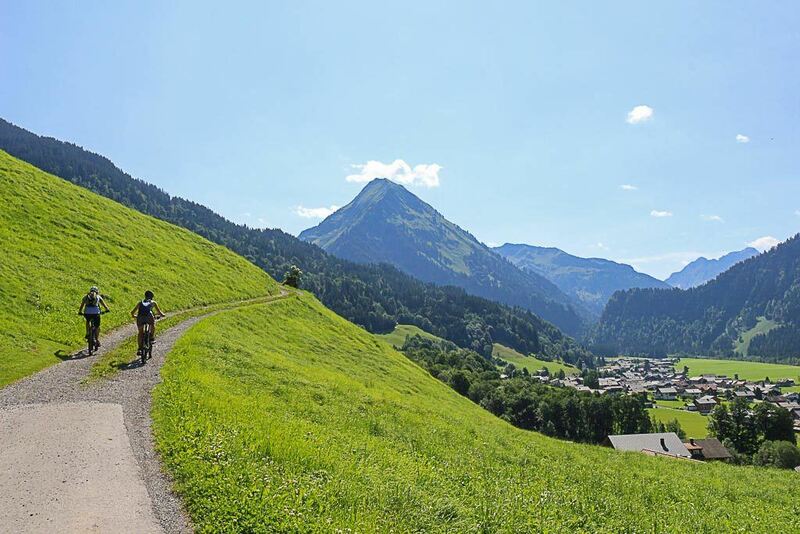 In Bregenzerwald there are 50 km of cycling paths and 450 km of signed mountain bike trails. The best part is that you don’t need to worry about anything, only pedal the bike or if you are too tired you can try the electric-bikes. There are many bike schools and bike rentals in Bregenzerwald, you can get all your equipment ready in one or two days in advance. Most of the schools and even the hotels in Bregenzerwald offer bike tours, perfect for those who want to have fun on two wheels without worrying about getting lost in the mountains. We went for a 3 hours mountain bike tour with Michaela, a lovely girl from our hotel and bike school. Our trail was easy but a bit hilly, going from Au to Schoppernau. 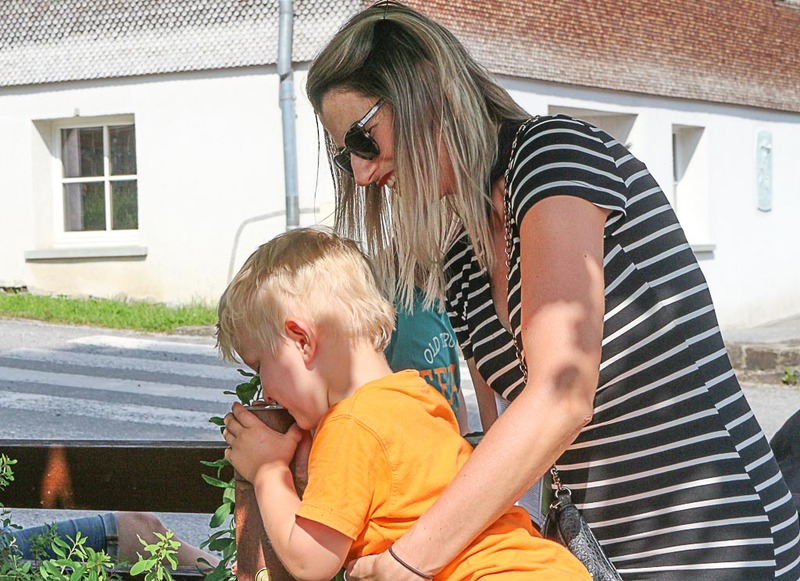 We passed by local farms, forest trails, wooden bridges and had a quick stop for an ice cold lemonade to beat the heat of the summer in Austria. We got our mountain bikes and equipment at the Die Bike Schule at the Hotel Roessle, where they have daily tour that you can join in. When I say summer in Vorarlberg means adventure, I’m not lying. After cycling in Bregenzerwald and feel our hearts popping out from our chests during the canyoning, it was time to meet Franko again for one more challenge. Even with a not so positive weather forecast, we woke up at 3 AM to hike one of the highest mountains in Bregenzerwald. Kanisfluh peak is 2,044 meters above sea level and we were going to hike part of the mountain to watch the sunrise from the top of the world. With head torches and a super slippery ground we started our ascend to Kanisfluh massif. It was pitch black, Franko guided us through a curvy trail, full of loose rocks, mud, frogs and salamanders. I was mentally prepared for this hiking, but my body wasn’t. I’m not sure if it was a mix of sleep deprivation and two days in a row of adventures, but it was a hard hike. The round trip from the car park to the top of Kanisfluh took us 3 hours, a total of 5 km of trail and an altitude gain of 576 meters. The path was very difficult and I wished I had better hiking boots. But the tiredness of going up was rewarded with an amazing view. We didn’t have the beautiful sunrise that I was hoping for, but what we saw was stunning anyway. From the top of Kanisfluh you can see as far as the Constanza Lake, the borders with Germany and Switzerland and many other mountains and peaks in Vorarlberg. The way down was easier and to wrap up our morning adventure nothing better than a scrumptious breakfast. We stopped at Edelweiss Hotel and Restaurant for a typical Alpine breakfast full of local cheese, berries and eggs. To do the Kanisfluh sunrise hiking you will need a guide. The trail is marked, but at night time it’s easy to get lost, plus the track is really rough so you might need someone to help you jump the river and climb some rocks. Our guide Franko was amazing again. I can’t think of a better person to recommend as a guide to adventurous things to do Bregenzerwald. He works with small groups and numerous outdoor activities, check Franko’s Facebook Page for more details. If you want to book a summer adventure with him you need to do it with at least a month in advance, especially for the hiking and canyoning. 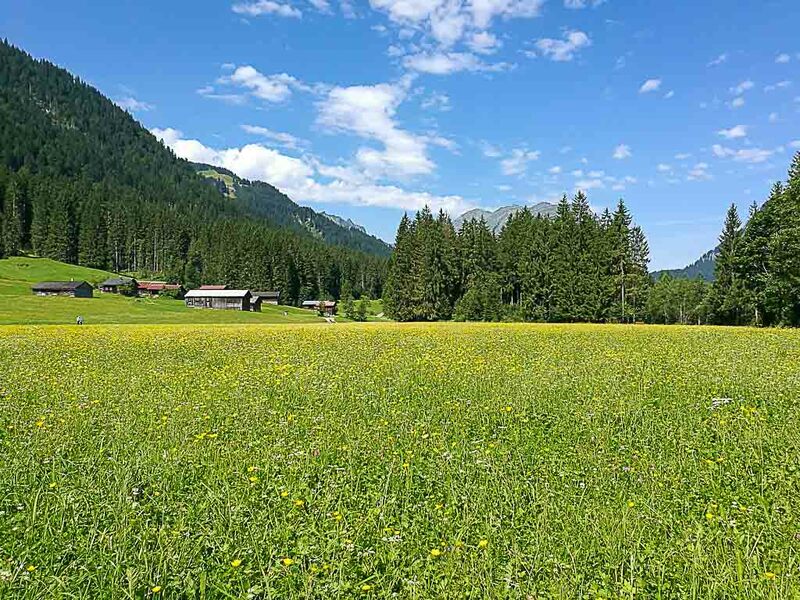 Hiking in Bregenzerwald is a big thing, the Bregenzerwald Summer Guide suggests 22 hiking trails marked and open to the public. But the region has over 1,500 km of trails, 50 hiking paths that are mentioned on the official map and many more that aren’t. 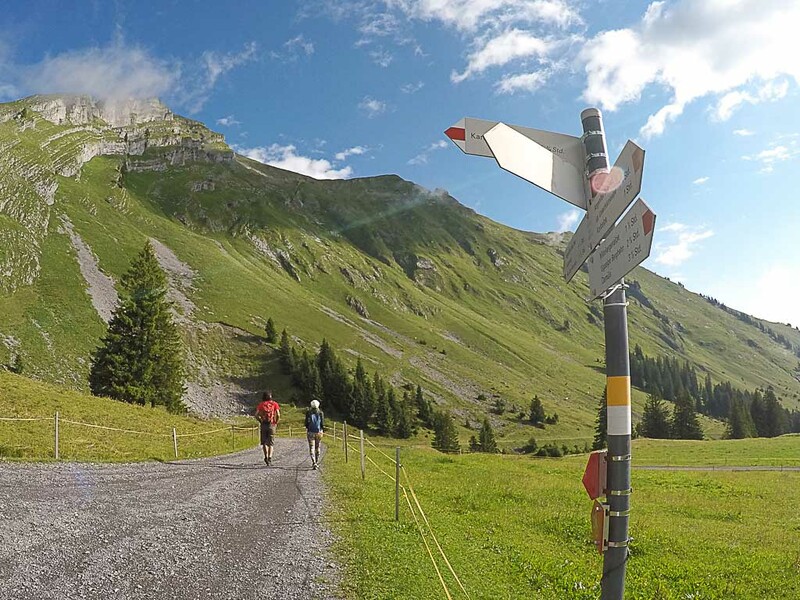 You can travel every summer to Bregenzerwald and hike a completely different trail every day. Some of the trails you can reach walking from the villages, others you will need to take a cable car to reach the alpine hiking trail. Doesn’t matter which trail you choose, if you have any doubt stop by the tourism office in any of the 22 villages and get the right information before venture yourself into the wild. Some of the trails are easy, others require a bit more experience and strength. You can hike in Bregenzerwald by yourself or if you prefer you can join a hiking tour [group or private]. At the tourist information, you find all the maps, or download the Vorarlberg App on your phone and use the online maps. [not all the maps and activities in the app are in English, so double check before starting the hiking]. We had 3 days in Bregenzerwald, so we manage to fit only a small hiking from Au to Schoppernau by the river. Actually, we run between the cities, as it was a flat path Rob took the opportunity to start his training for the Ironman Triathlon race. After competing in Brazil and in the Ironman Malaysia, this year he is gonna face the 70.3 Ironman Phuket in Thailand. 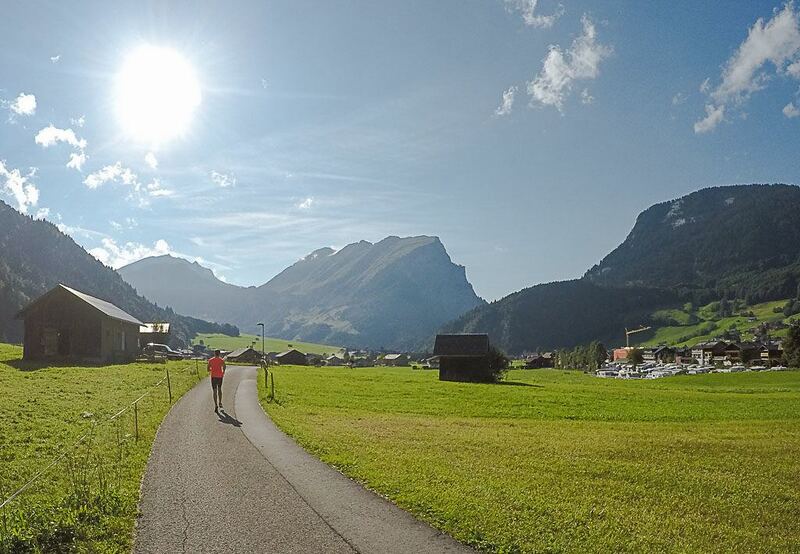 Cycling and running in Bregenzerwald was a great way to start his training. Cheese lover have one more reason to travel to Vorarlberg in the summer! Vorarlberg is known for its tradition on Alpine pasture resulting in unique flavors to the cheese and dairy products. And you can taste some of these delicacies, visit cheese makers and even produce your own Bregenzerwald cheese. All the info about the places to visit, farms, workshops, and restaurants you find on the KäseStrasse Bregenzerwald website. We didn’t have time enough to do the cheese trail in Bregenzerwald, as our focus was more on summer adventures in Vorarlberg. But we visit a very cool farm, where we learned about the cheese process and visited the stables for a quick hello to the goats. At Metzler Farm we discover that only 10% of the milk is turned into cheese and that 90% of what is left from the process is pure whey. So they are using the leftovers from the process to produce natural cosmetics. I was in paradise, delicious goat cheese and scented soaps, body moisturiser and shampoo. It was hard to not buy a bag full of those goodies. I didn’t know but Vorarlberg is famous for its unique architecture and the wooden craftwork. When visiting the region you can see how beautiful the houses and buildings are and how they use the wood in such marvelous way. The best part is that you can learn about the tradition of timber houses, the “shingles” decoration and how the new building techniques are being combined with old style. What I like the most is that the creative walk through Vorarlberg architecture and history happens in a funny and self-guided way. No need for boring tours or schedule to follow. What you need is a kit with maps and instructions to go hunting for the information poles. There are 12 villages listed on the Creative Walk, get the maps and try to find the orange pole in front of the historical places, tourist attractions or even local residences. Once you find the pole, press the button and look inside, there you will find the information about the building nearby. If you like treasure hunting, you gonna have fun doing the Creative Walk in Bregenzerwald. Not to mention that places are stunning, the villages are so perfect and cute that seems they have been photoshopped in the middle of the Alpes. You can get your Creative Walk Map in any tourist information in Bregenzerwald and also at your hotel. To get around the villages is easy, we are gonna talk about this later on. All the villages in Bregenzerwald are packed with family hotels, small guesthouses and mountain resorts. In Au we stayed at Hotel Roessle, a family hotel that has been welcoming travelers to Bregenzerwald for more than 50 years. What we loved is that all those years of experience are mixed with a modern and clean design! We stayed at the Mountain Bloom Room, with a view of the mountains covered with colorful wild flowers. I bet in winter the view from the balcony will be beautiful too. The room has everything you need to relax after a long day of cycling, hiking or canyoning. While the room decor is clean and timeless, the restaurant is a travel to the past, with old wooden floors and furniture that reminds the first years of the hotel. The service was awesome, we felt like staying with friends and family. Michaela, the hotel manager, went beyond her way to help us with the tours and activities. We stayed at Hotel Roessle on half board, so we had a huge buffet breakfast every morning and also a delicious dinner. We gonna talk about food later on, but if you are in doubt about booking your room at Roessle with half board service our advice is: go for it!! You will sleep and eat very well! 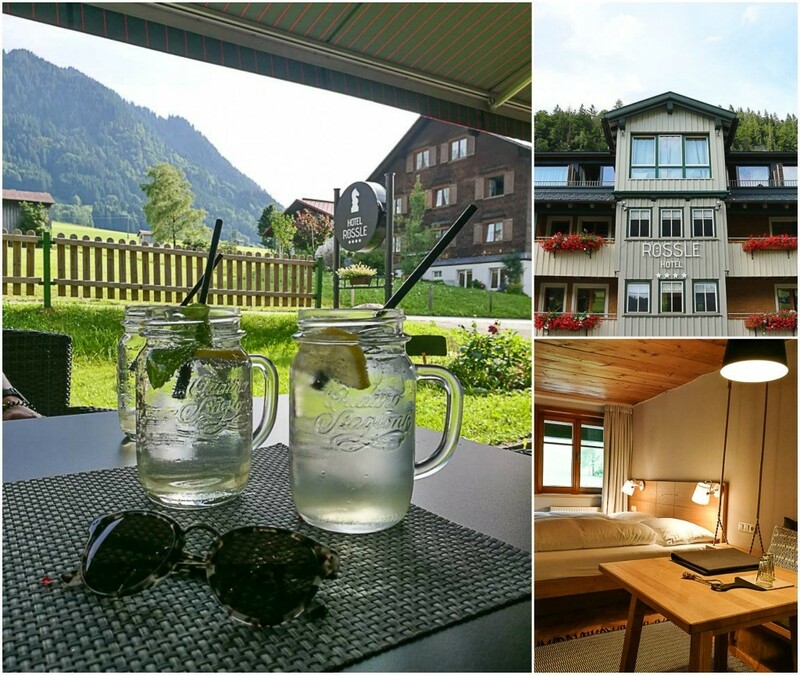 Best Hotels in Bregenzerwald – Check the summer rates! We are not food bloggers, but when we find good restaurants and delicious food I need to share. So here goes our recommendations for places to eat in Bregenzerwald, restaurants and hotels close by Au. It’s good to say that you will need a lot of energy to follow our list of adventurous things to do in Bregenzerwald. Forget the diet and stuff your face with a good mountain breakfast, what for me means a lot of cheese, yogurt and berries. Always have in your bag fruits, snacks and water to satisfy your cravings during the activities. And enjoy a delicious dinner when you are back to the hotel. Sleep and Repeat! We had two late lunches there are they were fabulous. Local cuisine served beautifully. Rob had the traditional käsespätzle, I tried the cheese soup and pasta with picante tomato sauce, everything delicious. Check the Adler Restaurant reviews here! We celebrated our 4 years wedding anniversary in Vorarlberg. After the extreme canyoning in Bregenzerwald we treated ourselves with a delicious and romantic dinner. Gasthof Hirschen Schwarzenberg was a recommendation from a local friend and we love it. The food was delicious served with a wide range of local wine. It’s not a place for your everyday dinner, but if you travel to Bregenzerwald you need to try it. Rob can’t forget his started with smoked trout and tomato foam and I would love to have the plate of Bregenzerwald cheese one more time. Check the Gasthof Hirschen Schwarzenberg reviews here! We stopped by this cute hotel for a quick break during our Mountain Bike Tour in Bregenzerwald. They have great berry lemonade, coffee and a nice garden. The menu looks good with reasonable prices, we didn’t try the food but our guide told us it’s a nice restaurant to try. You can travel to Vorarlberg by car, bus, train or plane. For international flights you can fly to Innsbruck in Austria, Zurich in Switzerland and Munich in Germany. As Vorarlberg is bordering these countries you have many alternatives to find the best deal. Our suggestion is to search your flights via Skyscanner or Kiwi.com, we use and recommend them. We traveled from Milan to Vorarlberg by bus. It was a 5 hours bus ride and we paid 22 Euros per person with Flixbus. Another option is to travel to Vorarlberg by train, the region receives daily trains from the major cities in Austria, Switzerland and Germany. With some connections you can arrive in Vorarlberg from almost any country in Central Europe. If you fancy train trips check out the Eurail Pass and read our experience of traveling the whole Europe for a month with the Eurail Pass. In Vorarlberg the public transportation works really well and once you have the timetables in hand you can organize your schedule and take full advantage of it. Doesn’t matter where you arrive in Vorarlberg, you can get to Bregenzerwald region by public bus. 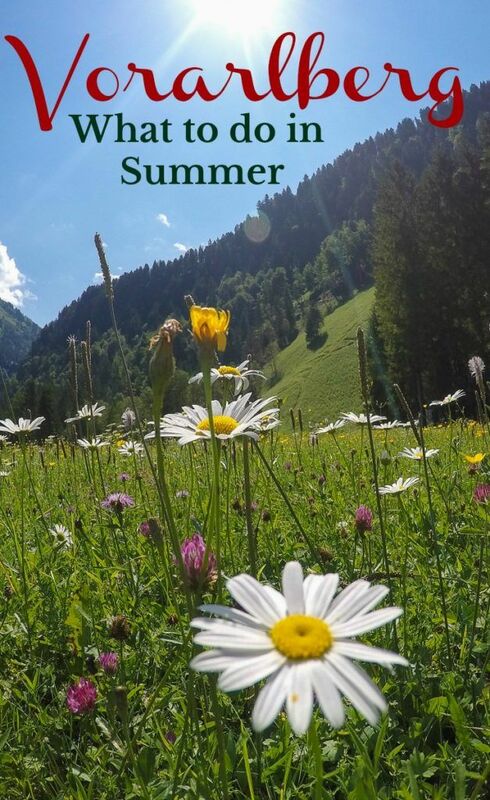 One of the cool things about traveling in Bregenzerwald during summer is the Guest Card for the season. It’s a money saving option and also gives you the freedom to explore the region at your pace and without the need of a car. Once you book 3 nights in any hotel in Bregenzerwald you receive for free the Bregenzerwald Guest Card that gives you access to all the public transportation in the region plus access to the cable cars. The hotel will give you a statement of your stay, get it and walk to the tourism office of the village and exchange that paper for your guest card and maps. Done! Easy and Free!! Love it!! 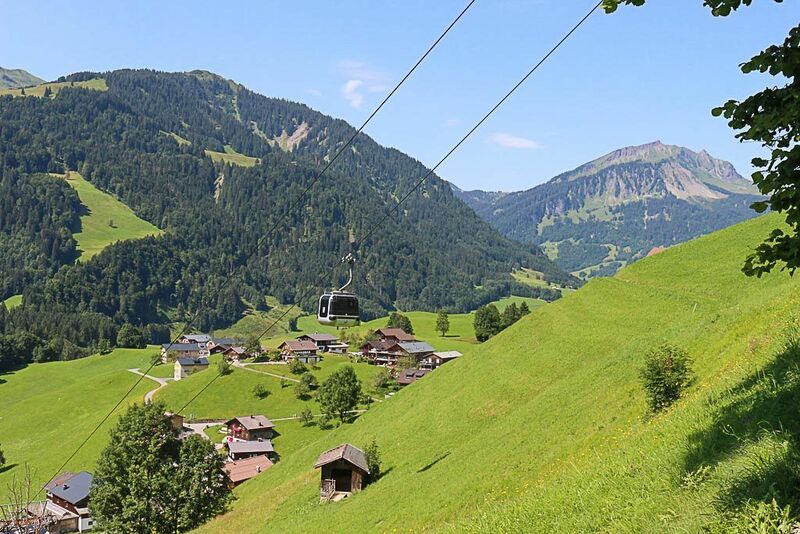 Doesn’t matter if you are going for a hike or if you want to do the Creative Walk, all the 22 villages in Bregenzerwald are connected by bus and you can use your card to visit them all. Also, you can use the card to take the bus to and back from big cities around the region like Bregenz, Dornbirn or Lech Zürs am Arlberg. The Bregenzerwald Guest Card is valid from May to October, it’s a summer thing. The last topic of our post is a super important one. It is summer in Vorarlberg and it will be hot [that’s what we all hope for]. But the top things to do in Bregenzerwald are related to nature and outdoors, so you will need to be prepared for sunny days, rainy days, cold nights and alpine winds. All the maps for hiking, activities and event can be found on the Vorarlberg website, Bregenzerwald website or at any tourist information office spread around the villages. Are you ready to enjoy the summer in Vorarlberg and discover all the adventurous things to do in Bregenzerwald? I’m sure it will be a holiday packed with adrenaline and beautiful memories. Love this post?! So Pin it for later!! Share the love for Vorarlberg, Austria. It does not look real at all Natalie. Inspired shots too! Seeing your pictures and reading the post reminds me of the movie The Sound of Music. The hills are alive….you know how it goes 🙂 Just stunning beauty in Austria. When I finally visit my kinda homeland Germany – 1/4 German here – I will also head to Austria for a nice trip through the hills to enjoy this breathtaking beauty. If you head to Germany do stretch your trip to Vorarlberg, totally worth it! Indeed beautiful. Exactly why I made the move 20 years ago from the states to live in Au. Very comprehensive guide. Well done. I’ve been to Austria loads of times but never had the chance to Vorarlberg. The images look absolutely breathtaking. Vorarlberg is stunning and you should visit during your next trip to Austria.